Families with dogs and cats often do not realize that their pets need regular dental care to ensure their overall good health and wellness. Statistics show that well over three quarters of pets have never had their teeth brushed, and most have never had professional pet dental care. If your pet has bad breath, seems to have pain while eating, has lost his or her appetite, presents swollen, bleeding gums, or has lost any teeth, he or she is probably suffering some level of painful dental disease (gingivitis or periodontitis). Even without these symptoms, dental problems may still exist and the bacteria involved in dental disease can travel into your pet’s bloodstream to cause heart, liver and kidney damage if not stopped. If your pet has never had his or her teeth brushed, please call our Hamilton veterinarian to set up a pet dentistry appointment. Dogs and cats should see our pet dentist at least once a year, and pet owners should establish a daily dental hygiene habit for their pets at home. During a pet dental checkup, our veterinarian will examine your pet’s teeth to determine their condition and then ultrasonically clean them to remove tartar buildup. If periodontal disease has already taken hold, our pet dentist may also need to perform extractions or other dental surgical techniques. Exams, cleanings and extractions need to be done under our safe anesthesia procedures. Before any such procedure, we always run a complete blood screen to check for any hidden health issues. Your pet will also have a veterinary technician on hand at all times to monitor your pet’s vital signs and comfort levels to make sure everything goes smoothly and safely. Pet dentistry is quite safe, and by far outweighs the suffering and cost of letting dental disease advance to possible life-threatening bacterial infections. 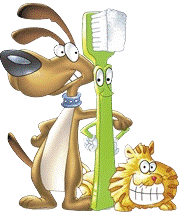 Our pet dentist will also show you how to begin a teeth brushing regimen with your pet at home. The process is not as difficult as it may seem and most pets learn to enjoy this daily personal time with their owner over time. First you will need an especially-formulated pet toothpaste (do not use human toothpaste) and a pet toothbrush. There are several types and flavors and we can help you find the one best suited to your pet. For the first few days, just allow your pet to examine and lick the toothbrush with a little bit of toothpaste on it. We suggest doing this at the same time every day, accompanied by copious praise. Gradually, over the next few days, work up to moving the toothbrush into your pet’s mouth and start gently brushing, particularly along the gum line. Pet dentistry is a critical aspect of your pet’s overall wellness, and we are ready to help. Please call us at 289-639-5540 to schedule an appointment.